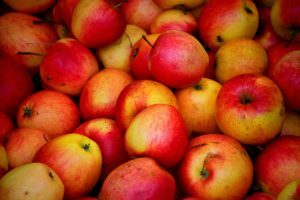 Read next: Read nextIs that apple ripe? Some groups are as genetically different from one another as brown bears are from polar bears. Researchers have long recognized only a single species of giraffe, thought to be made up of several subspecies. However, a research collaboration has now identified four distinct species. Conservation biologist Julian Fennessy of the Giraffe Conservation Foundation, geneticist Axel Janke of the Senkenberg Research Institute, and their colleagues collected and analyzed samples from giraffes across the African continent. Their results appear in the journal Current Biology. ResarchGate: When and why did you start genetically testing giraffes across Africa? Julian Fennessy: When I approached Axel Janke to help with genetic testing on giraffe five years ago, l had been collecting giraffe DNA tissue samples for more than a decade. I was interested to know whether genetics would help answer some critical conservation concerns, including how similar or not giraffe (sub)species are, if past translocations of giraffe had “mixed” different (sub)species and if so, how this knowledge could be used to inform future translocations of giraffe into parks or other protected areas. Additionally, I thought there could possibly be a genetic grade among giraffe along a north-south axis, and that a population of giraffe in Zambia’s Luangwa Valley National Park could represent a link between these. This idea turned out to be incorrect. RG: What level of genetic variation did you find that led you to the conclusion that there are four distinct species of giraffe? Fennessy: The first analyses of genetic markers from mitochondrial DNA, a molecule that is often used in such studies, revealed a surprising amount of genetic differentiation among what were previously assumed to be nine subspecies of giraffe. Dr. Janke had rarely seen such a large amount of genetic differentiation within a species, and this intrigued him. The sequence differences between some groups were even greater than between polar and brown bears. So there had to be more to the story of giraffe evolution. Subsequently, our research expanded and led to sampling all major giraffe populations in Africa, establishing that there are not just one, but in fact four distinct species of giraffe. Some of the analyzed genetic markers, which are approximately 800-nucleotide-long DNA sequences, are specific to each species. The findings suggest that genetic exchange among the four species is rare, maybe even nonexistent. This genetic isolation defines them as distinct species, as opposed to subspecies. RG: Did you have any suspicion of the results? Fennessy: We were extremely surprised, because from our observations the morphological and coat pattern differences between giraffe are minor. To confirm our findings, we used numerous different analysis methods and involved a taxonomist, Prof. Uwe Fritz, to be sure about the taxonomical implications. All-in-all, we were not interested in splitting or clumping giraffe, but we let the results speak for themselves, and the message is very clear. RG: How do the four species differ? Fennessy: In addition to differences in coloration and pattern, some of the species have much larger and more numerous ossicones, the protuberances on the head. For example, northern giraffe have five distinct types of ossicones and southern giraffe only three. With respect to their behavior, there has been so little research on each of the respective species that there is no data to enable any detailed comparison. In terms of distribution, species’ current ranges are not always delineated by geography, and therefore some other ecological are at play in keeping them separate. However, habitat loss, fragmentation, and degradation resulting largely from human population growth are increasingly causing giraffe populations to become more and more isolated across the continent. RG: How did you go about collecting the samples to test? Fennessy: The DNA tissue samples were collected through a variety of means, primarily remote biopsy darting, sampling of wild giraffe that had been captured for translocations or GPS satellite collaring, and sampling from deceased individuals. Remote biopsy sampling is simple and stress free, with a specifically designed dart fired from a veterinary dart gun. It hits the giraffe and immediately falls out with a small piece of skin. We worked closely with partners across the continent, including governments, NGOs, private land holders, conservationists, and researchers to sample or collect giraffe samples, all with approved national permits. We were lucky to go to some amazing places to sample some of the last giraffe to help unravel this mystery, including far western Ethiopia on the border with South Sudan, northwestern DRC, Niger, and the remote northwest Namibia. RG: How were you able to collect samples from areas of civil unrest? Did you encounter any problems? Fennessy: A major part of the process of collecting samples was the development of good collaborations and partnerships across the continent. For over a decade, new relationships were forged, permits obtained, and field work undertaken. However, in areas of civil unrest we faced a few hairy situations, and partners like African Parks Foundation proved invaluable in their support. One specific example ended in a situation that none of us expected. In far western Ethiopia on the border of South Sudan lies Gambella National Park, which is essentially a park by name only. Working with the African Parks Foundation, we helped fit a number of species with GPS satellite collars, but my main interest were obviously giraffe. Importantly, we were able to collect the first-ever wild Nubian giraffe samples. On our last day, we planned to find and fit the final collar, but going low over their preferred habitat we spotted a group of people and their cows. Without warning they aimed their guns at us and started firing. As the helicopter pilot quickly reacted to avoid being hit we felt a thud, but luckily we were able to make it to safe ground a few kilometers away. After a quick check and no real damage, we returned to camp, the sampling trip over. All I can say is, all’s well that ends well! RG: What do your results mean for conservation efforts? Fennessy: The conservation implications are immense, and our findings will hopefully help put giraffe conservation on the map. With four distinct species, the conservation status of each can be better defined and in turn added to the IUCN Red List as appropriate. Working collaboratively with African governments, the continued support of the Giraffe Conservation Foundation and partners can highlight the importance of each of these dwindling species, and hopefully kick-start targeted conservation efforts and international donor support for their increased protection. Northern giraffe, for example, number less than 4,750 individuals in the wild, and reticulated giraffe number less than 8,700 individuals. As distinct species, that makes them some of the most endangered large mammals in the world and of high conservation importance. The Giraffe Conservation Foundation has increased targeted support to the conservation of these giraffe species as a result of these new findings, and we are keen to increase these further if we can raise additional support. For some reason this megafauna has been overlooked by scientists for a long time, despite their size and iconic stature. In contrast to research on elephant, lion, rhino and gorilla, there has only been relatively little research on giraffe. There needs to be greater public awareness, education, and protection for giraffe, their conservation and their habitat. 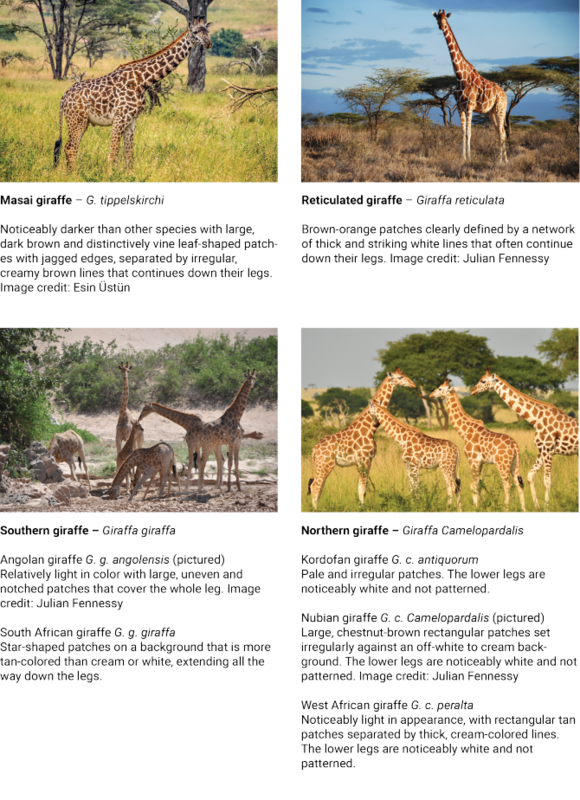 If you’re interested in learning more about giraffe conservation or donating, you can do so on the Giraffe Conservation Foundation website. Featured image courtesy of the Giraffe Conservation Foundation. Credit: Julian Fennessy.